Martha's Favorites: HAPPY HALLOWEEN AND TEA CUP EXCHANGE! Hello Ladies: Welcome to Tea Cup Tuesday No. 322! Happy Halloween, always a fun time when children are involved. Sorry about last week, back was acting up. Improvement this week and for that I am grateful. I shared a few weeks back that I had joined "The Enchanted Rose," Tea Cup & Mug Exchange. Today the group is sharing their treasures. My treasures came from Linda of Mysewwhatblog@blogspot.com. This was only the second time I have been a part of a Tea Cup Swap and it was so much fun. Just take a look at the lovely items I received. It felt like Christmas, as I opened up the package. Everything was so beautiful and it was all pink, my favorite color! A lot of the gifts included hand made items by Linda herself. I was so thrilled. Thank you so much again Linda. I love it all! 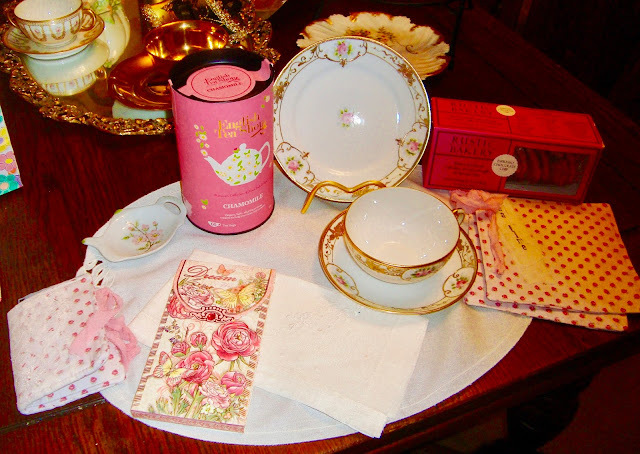 Love the beautiful teacup gift you received from Linda. She sent to me a few years back too and it was a blessing to receive. I know you love her handmade items and the teacup is gorgeous. What a blessing to receive from such a talented friend. Sophie's costume is adorable. She is truly a princess. Have a nice evening and Happy Halloween. p.s.Thank you again for my teacup gift. I just love everything and enjoying the tea so much. 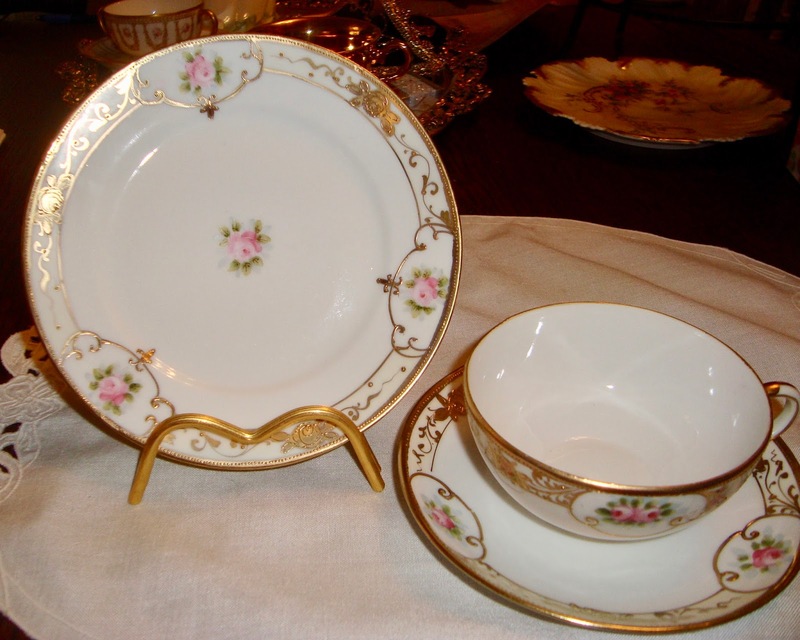 Your teacup from Linda is a beauty! Stephanie's teacup swaps never disappoints. I look forward to the big reveal on Wednesday. Thanks for hosting and Happy Halloween! P.S. Sophia's Rapunzel costume is too cute! So happy that you enjoyed your package! It was a pleasure putting it all together for you! Stephanie does such a nice job arranging all of this for us! Glad that she gave me your name! I suspect I will be a regular reader of your blog. Love that there are so many photos of tea cups!!! So...I'll be back! Nice meeting you Martha! What wonderful gifts you've received from Linda, Martha. Linda is such a dear and we are now friends because I sent gifts to her a year ago. Isn't this exchange the best?! Stephanie is such a darling for organizing this event for us to enjoy. Your Sophia looks adorable! Thanks so much for hosting and I'm glad that you're feeling better. Happy Halloween! That teacup looks just like one you would love Martha! It reminds me of one I won on your blog a while back. We ladies love our pink, don't we?! Your little Rapunzel looks so beautiful!! What little girl wouldn't love all that long hair and pretty dress?! I thoroughly enjoyed seeing your treasures from Linda - isn't she a doll! She sent to me several years ago and I know she pours lots of love and care into her packages. Her handmade items are simply delightful. Enjoy, dear Martha! And thanks again for joining the fun. Hugs! Oh, how fun. 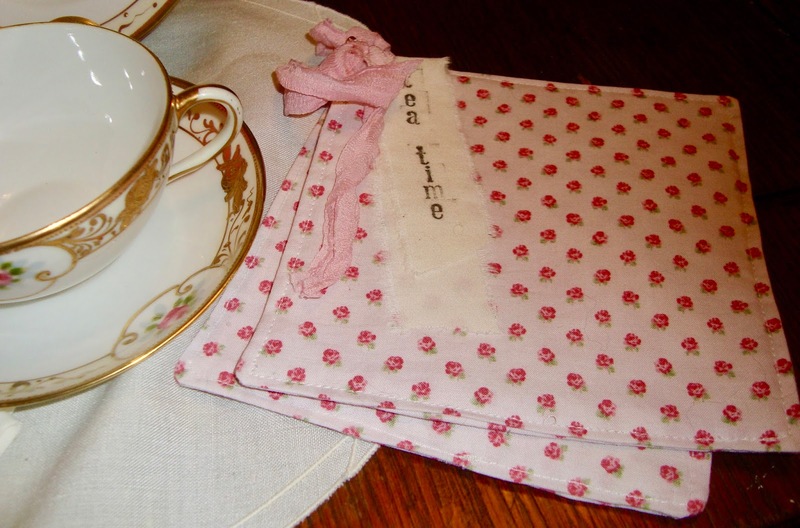 Yours is the 4th blog post I've read today about this lovely teacup exchange. Wish I had known about it, so I could have gotten involved myself. Your gifts are beautiful, and it's so sweet that you received so much pink! Sophia is adorable! Great costume! Sophia is a doll! 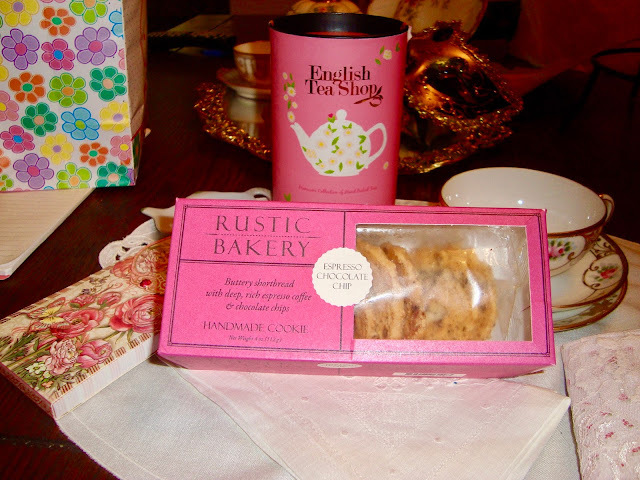 I like those cookies from the Rustic Bakery! Thanks for hosting! The pink in the teacup package is so pretty. So soft and feminine and inviting! Also, Sophia is adorable in her costume; Rapunzel is my favorite too! This package is just so beautiful. You certainly were blessed! A wonderful teacup and goodies received in your exchange parcel. Oh, dear friend! I just LOVE all of your goodies! Oh, how pretty and dainty and feminine they are! It is such a joy to see you so blessed today! So thankful to visit with you, and may God's richest blessings continually be yours! Martha i love your package. Love this exchange. Sophia is a little doll. 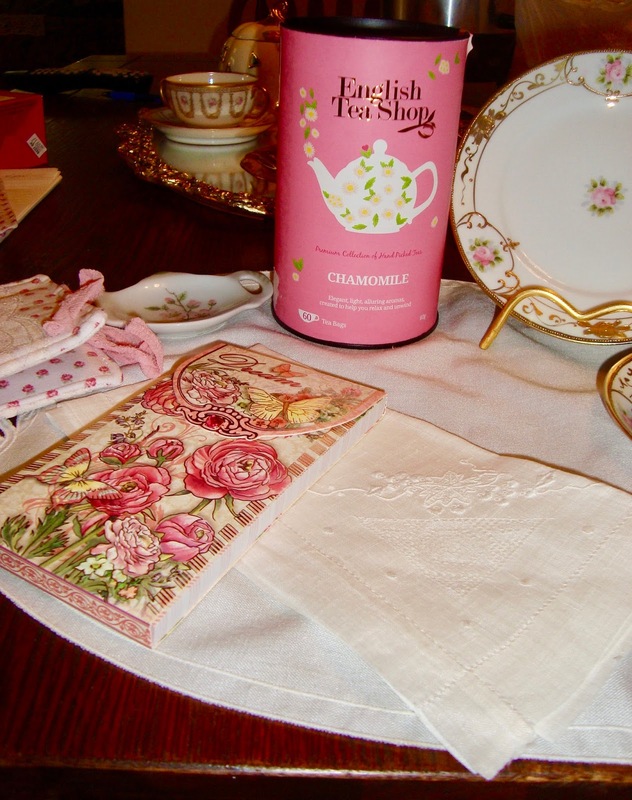 Your teacup exchange was perfect for you ... beautiful pink! Wasn't it fun?! Hope all is well with you. Happy Tea Day! Martha, your treasures are awesome! I *adore* your teacup set! Your sweet costumed grand is adorable too. Wow! Linda did a beautiful job putting her package together for you. That trio tea cup is stunning and pink...Oh yes. I am a sucker for new kinds of cookies and those look divine! I love all the pink! Pink just makes things more delicious, I'm sure of it. It's hard to have any complaints about this place. It's easy to get a drink since they actually keep enough bartenders working at once, and you'll almost always find a place to sit. I love the vibe at Los Angeles venues, the area, the people and the food at this place.